Crab Cakes - Delicious and Cost-friendly Crab Cakes Made at Home! 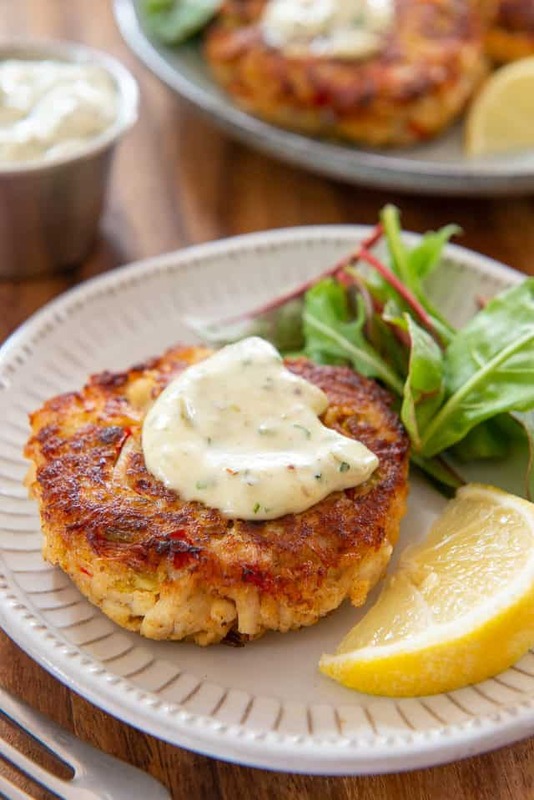 Crab Cakes are an easy treat to make at home, for much less money than what it costs at a restaurant. 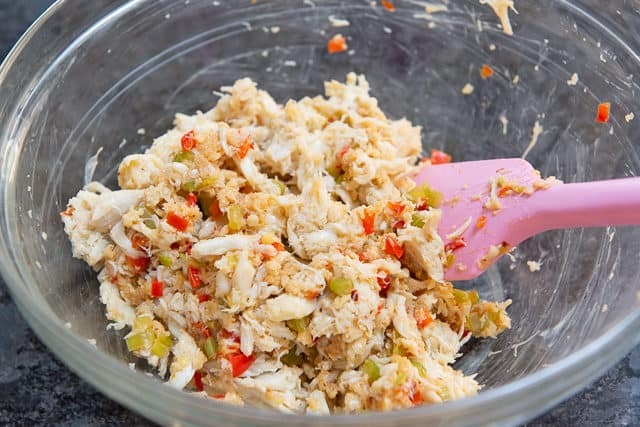 This recipe has plenty of lump crab meat and lots of flavor! I have never been able to resist crab cakes, to the point where whenever I went to a restaurant that had the dish on the menu, I’d have to order it. There’s something so wonderful about crispy cakes of crab, accented with a bit of old bay seasoning and flavorful vegetables like pepper and celery. 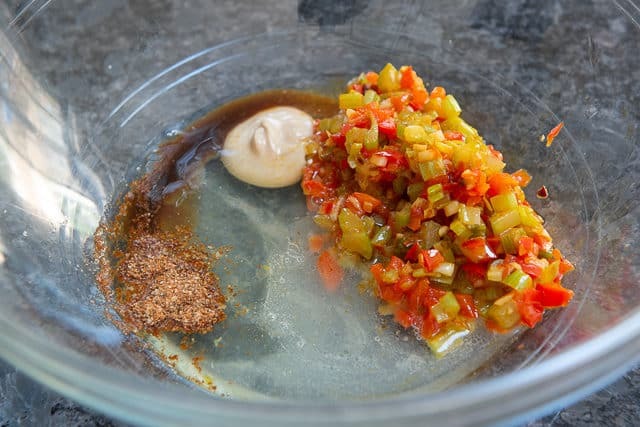 This version in particular is very much about the crab, as in it’s barely held together with binders like bread crumb and egg white, but it has a bit of a creole flavor theme happening. My mom made them like this when I was a child, and I love how the flavors accent the crab. However, if you’re looking for the most purist crab cake out there, this is not the one (my friend Jen has a Maryland Style version that might be more suitable). I actually think that the pre-picked crab you buy in a container at the store is not quite good enough for a completely stripped down version, as the fresh flavor and nuances of the crab aren’t as present as freshly cooked crab. And that’s exactly what makes this a good opportunity to save a little bit of money and simply get the lump crab meat, instead of splurging on the jumbo lump. There are still plenty of nice morsels of crab meat. Even though I’m using fresh crab from the refrigerated section (not canned from the shelf), there is almost always excess liquid. 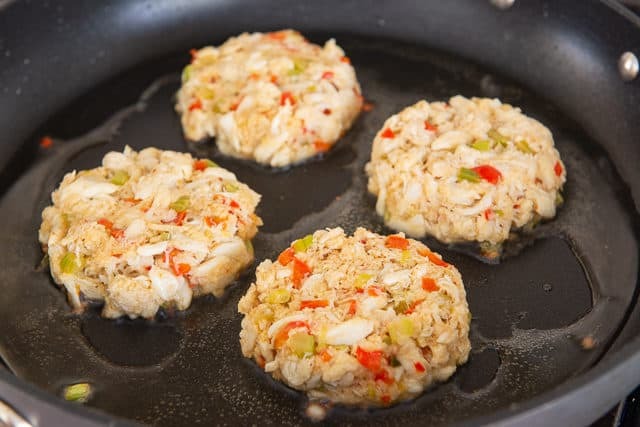 Shape the crab mixture into four patties, pressing them firmly. 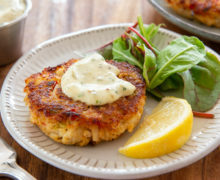 Drain the crab cakes on a paper towel, then serve with tartar sauce and lemon wedges, if desired. Fried Calamari is another one of my favorite seafood appetizers to make at home, as well as Shrimp Salad and a good old Lobster Roll. Enjoy! 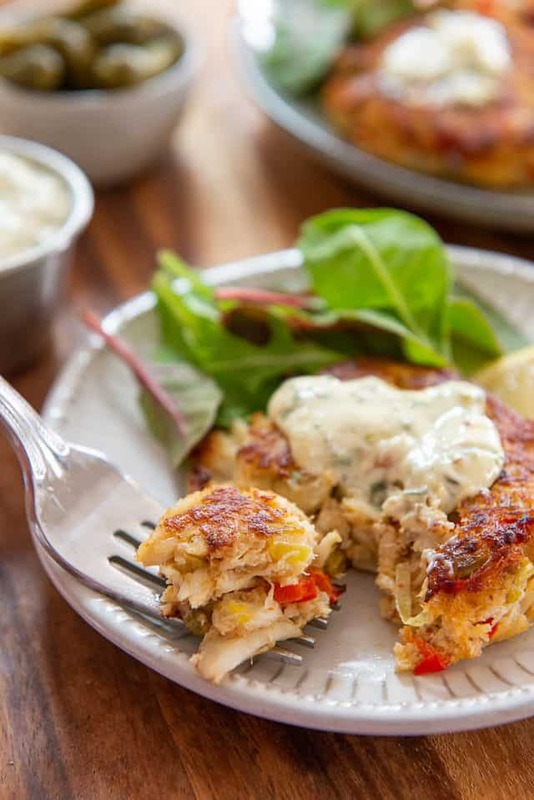 These Crab Cakes are made from scratch, with plenty of lump crab meat and just enough flavoring and ingredients to hold it all together. Heat a nonstick skillet over medium heat and add 1 tbsp olive oil to the pan. 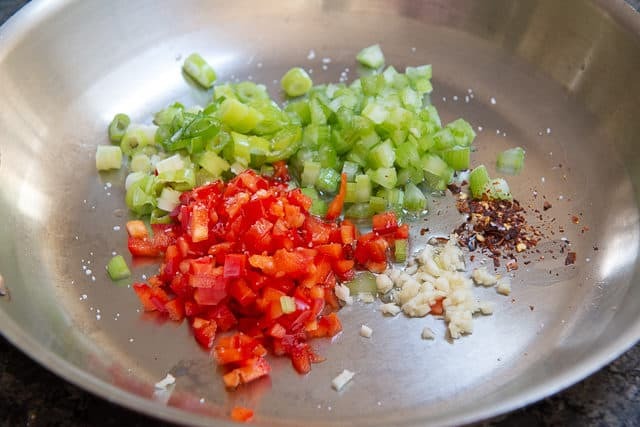 Add the celery, bell pepper, scallion, garlic, red pepper flakes, salt, and pepper. Cook for 7-8 minutes, until the vegetables are soft. Transfer the mixture to a bowl. Add the mustard, egg white, worcestershire, and old bay to the vegetables, and mix well. Add the bread crumbs and mix again. 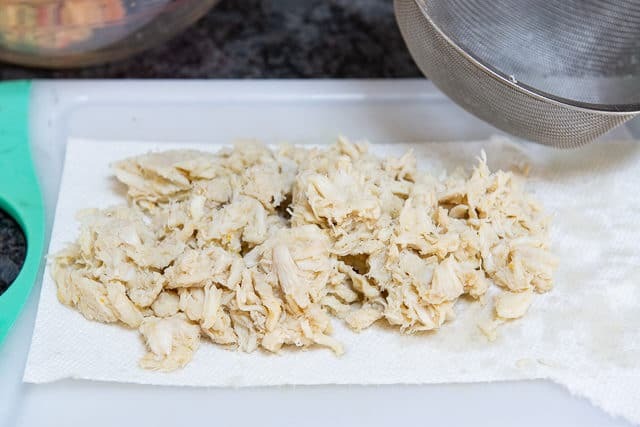 Place the crab meat in a paper towel and gently squeeze to absorb excess moisture. 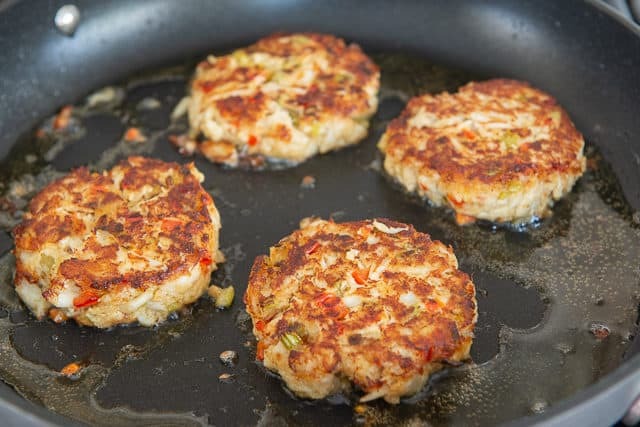 This step prevents the crab cake from being heavy or soggy in the middle. Gently fold the crab meat into the vegetable mixture, making sure you don’t overstir the crab to the point where the morsels fall apart. 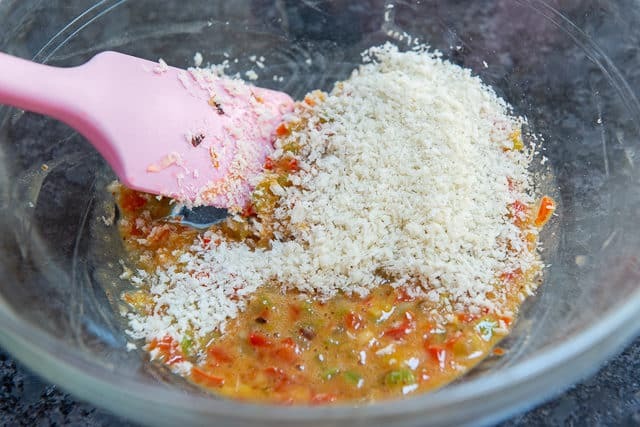 Divide the crab mixture into 4 portions and shape them into patties, pressing them firmly. Heat a nonstick skillet over medium high heat and add just enough olive oil to coat the bottom of the pan. Fry the crab cakes on each side for about 2-3 minutes, until golden. Serve with tartar sauce and lemon wedges, if desired. Enjoy! Since crab is often somewhat salty, I do not add extra salt to the crab cake mixture. I recommend salting to taste if you enjoy heavier seasoning. Post updated in February 2019. Originally posted in July 2011. 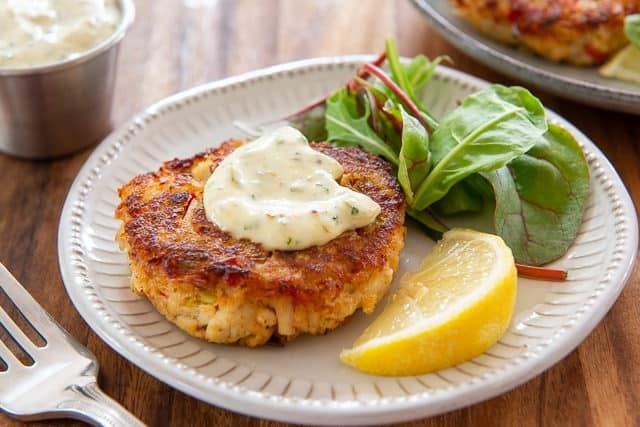 I love crab cakes and these look wonderful! you know, I’ve never tried crab cakes, but they sound tempting with a recipe like that! I like the way you prepare these crab cakes, they look awesome!